When it comes to learning about “something big” in the world of potentially lifesaving medical scans – specifically, positron emission tomography (PET scans) and computed tomography (CT scans) – the person to ask is Jeff Esham. Esham, vice president of radiation oncology and radiology for Florida Cancer Specialists, is responsible for imaging at the nearly 100 statewide offices of Florida Cancer Specialists, and for putting those services on the road. Once each week, a large tractor trailer has been delivering a new – only 1 year old – Siemens mCT 20 PET/CT scanner right to the backyard of Florida Cancer Specialists’ Vero Beach offices at 3730 7th Terrace. The tractor departs after delivery, leaving the special trailer with the scanner inside. Two or three days later, another “big rig” hauls it away, but in the meantime, local physicians like Drs. Hugo Davila, Raul Storey and Noor Merchant have full access to some of the newest scanning technology available to diagnose their patients. If the sheer logistics of moving sophisticated imaging equipment here and there all across the state doesn’t impress you, maybe the capabilities of that equipment will. Well-known Vero urologist Dr. Davila says the mCT 20’s scans are “one of the most useful tests for finding and looking at a tumor in the kidney. It can provide precise information about the size, shape and location of a tumor. It is also useful in checking to see if a cancer has spread to nearby lymph nodes or to organs and tissues outside the kidney. “With our CT scans,” Davila continues, “we can do 3D reconstruction of the imaging to identify important structures before surgery (robotic radical nephrectomy or partial nephrectomy). This allows me to review the anatomy and discuss the surgical steps with my team” well in advance of surgery. As the Center for Diagnostic Imaging explains, combined PET/CT scanners use modern imaging techniques along with sophisticated computer technology to produce 360-degree, cross-sectional views of the body, its bones, soft tissue and even its individual blood vessels – all at the same time. After all, he says, each air-conditioned unit is also equipped with its own backup generator as well as an industrial chairlift to provide easy access to patients in wheelchairs as well as fully ambulatory patients. The “bore” or “donut hole” into which patients slide while the scan is being done is quite large. It’s not nearly “as tight a fit” as most older scanners, Esham says. He couldn’t be much happier with the response this particular scanner has gotten from Vero Beach patients. 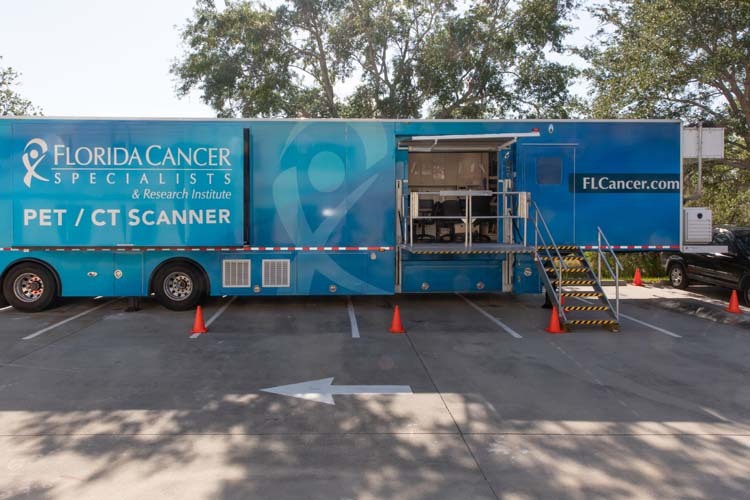 In fact, if the number of scans and the patient reactions continue the way they’re going now, Esham hints that FCS’s Vero office may soon have its own, permanent PET/CT system while the mobile version sets out on the road again to other parts of the state. And if keeping an eye on Medicare’s pocketbook interests you, Esham claims his “fleet” of mobile PET/CT scanners can be 17 percent less expensive for Medicare than in-hospital scans. Dr. Hugo Davila is with Florida Cancer Specialists and Florida Healthcare Specialists at 3730 7th Terrace, Suite 101 in Vero Beach. The phone number is 772-581-0528.